Hereford United have confirmed the appointment of Simon Davey as the club's new manager on a two-year deal. 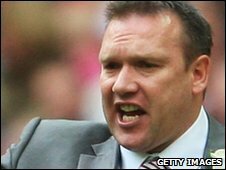 Davey quit his job as Darlington boss last week and takes over from Graham Turner who left to manage Shrewsbury. Davey told the club website: "Hereford is a club that's always enjoyed a tremendous reputation. "From what I know the fans are amongst the most loyal around. My football philosophy is to play attacking football, I want to win in style." Davey, whose playing career took him from Swansea to Carlisle and then Preston, had his first taste of management with Barnsley in 2006. He famously took them on a memorable FA Cup run in 2008 with victories over Liverpool and Chelsea, before losing to Cardiff in the semi-final at Wembley. After being sacked in August 2009, he took over at struggling Darlington in April of this year, but was unable to stop them being relegated to Blue Square Bet Premier. Davey quit as Darlington manager in June by email after only three months with the club. Hereford chairman David Keyte said: "He has every quality we were searching for. "Experience of managing, coaching expertise, good contacts at the highest level, and a burning desire and a hunger to be successful. "Simon is happy with his playing budget for next season and we're building in new incentives which will reward success. "We don't need to set targets because Simon has all the determination and drive in the world, and he's aiming high."